Dr. Seuss "Today you are you, That is truer than true. There is no one alive Who is Youer than You." This workshop is all about you and how to record some of your life events. 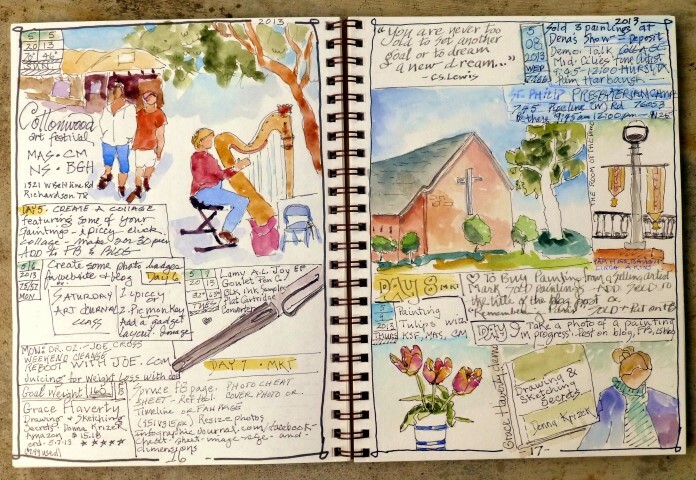 This sketchbook journaling workshop will be an introduction to sketchbook journaling with pen and watercolor and will focus on YOU with a "Love Your Life" theme. 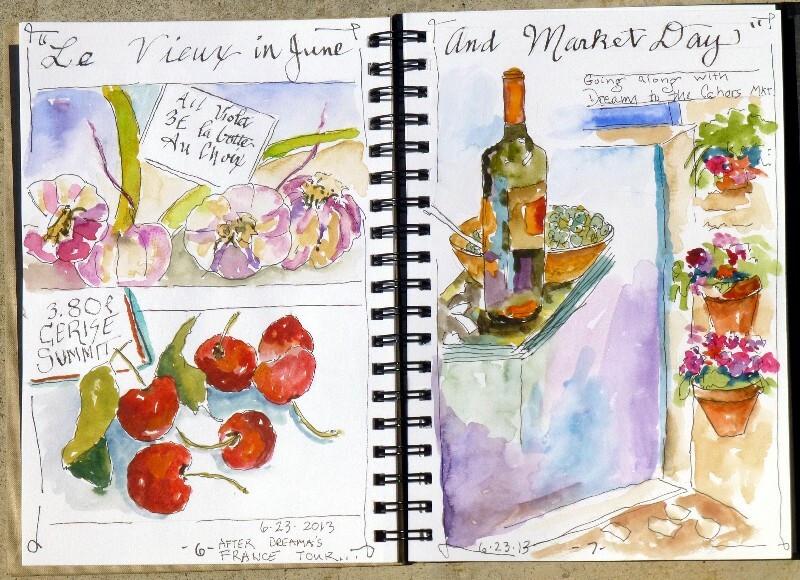 We will explore choices in sketchbooks and paints and palettes, examine some great reference books and I will demo techniques I use to keep various sketchbook journals. The student does not need any previous art experience but just needs to come with the desire to explore some possibilities of preserving some moments on their life journey. 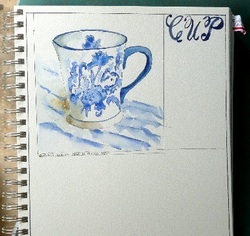 For example, we usually have some type of hot beverage each day and here is an entry I made in a previous art journal workshop of a favorite coffee cup. We will begin with a structured lesson like this and then students will be able to add their personal experiences to their journals. Day one we will record things around you in your daily life and day two we will talk about recording events during travel, such as architecture and people. I will talk about making it a personal journey with no rules and no one has to see your entries but you if they are very private - no comparing with your neighbor but only judge from your last entry. For the Grandmothers: This works as I love to record a page for new births for the grands and add the statistics but also add some details of feelings and what was said, what the day was like. In years to come and especially on birthdays you can share with the child how much they are loved and share the page with them. It's awesome. Below is an entry from a journal page from March, 2009 when some girlfriends and I went on a painting weekend and as you can see drawing skills can be minimal. Other recent journal entries are posted below. 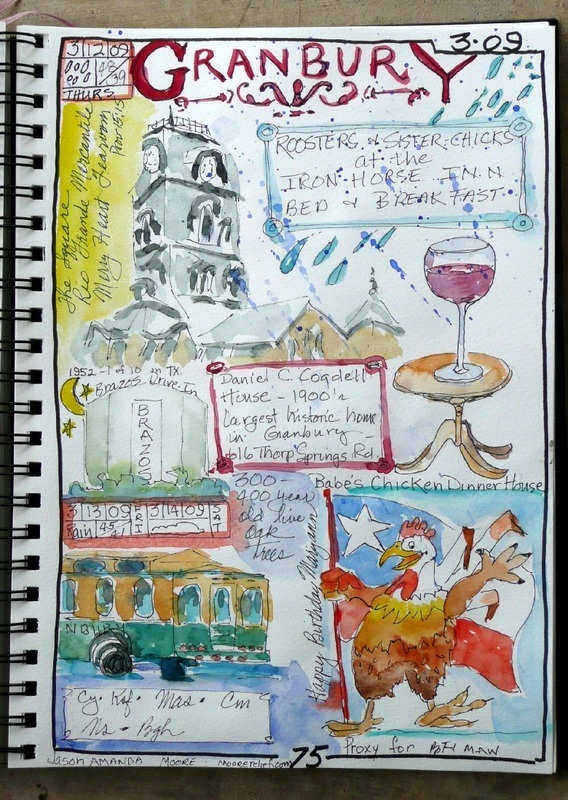 The journal entry for my plate of food at the Blue Mesa Grill resulted in illustrations for their new menu February 2014. For the past 6 weeks I have been enrolled in Sketchbook Skool online (sessions 1 and 2) and studied with a different instructor each week and I've enrolled for semester three. For sketchbooks, I recommend an 8 x 10 to a 9 x 12. It is important that your sketchbook be spiral bound so that it will lay flat while you are painting. The paper weight should be strong enough for watercolor washes. In this workshop the 9 x 12 will be used but if you have an 8 x 10 and don't want to go to the expense of buying another, bring it. 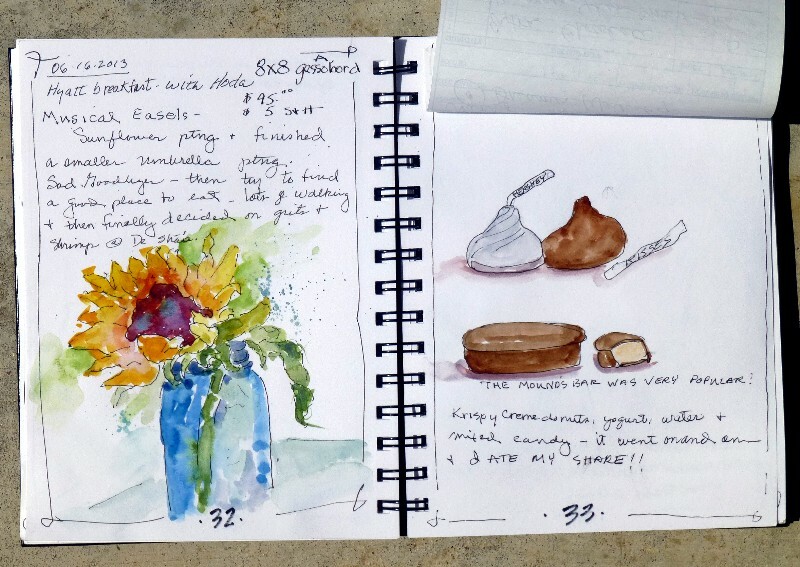 I will bring examples to share..
An option: IF you sign up at the last minute and do not have time to get a bound sketchbook, you could bring pages of cut watercolor paper to do some of the exercises and put them in a 3 ring notebook. An all media journal around 90 lb. weight. (gsm weight is different) 1. Canson Montval Field All Media Book 9 x 12 Canson Montval is a fine quality, acid-free paper. The Montval Field All Media Book is a hardcover, 50 sheet pad bound with extra-wide rings so the pages lie flat. Its 90 lb Cold Press all-purpose sheets are an excellent surface for watercolors, pencils, pens, and charcoals. 2. Aquabee Super Deluxe Sketchbook 9 x 12 Natural white, heavyweight, textured paper has a neutral ph and is double-sized to accept wet media. It also renders beautiful results with charcoal, pencil, and more. There are 60 archival-quality sheets per pad, spiral bound to a unique waterproof leatherette cover. 93 lb (152gsm). 3. Pentalic Nature Sketch Book 11 x 8 1/2 The pages in this sketch book are heavyweight, 130 lb (211 gsm), 25% cotton sheets with a toothy, rough vellum surface, suitable for pencil, charcoal, ink, acrylics, pastels, oil pastels, watercolor pencils, watercolors (light washes), and tempera. Each plastic spiral-bound book contains 50 sheets, with a heavy chipboard back that prevents buckling. 5. 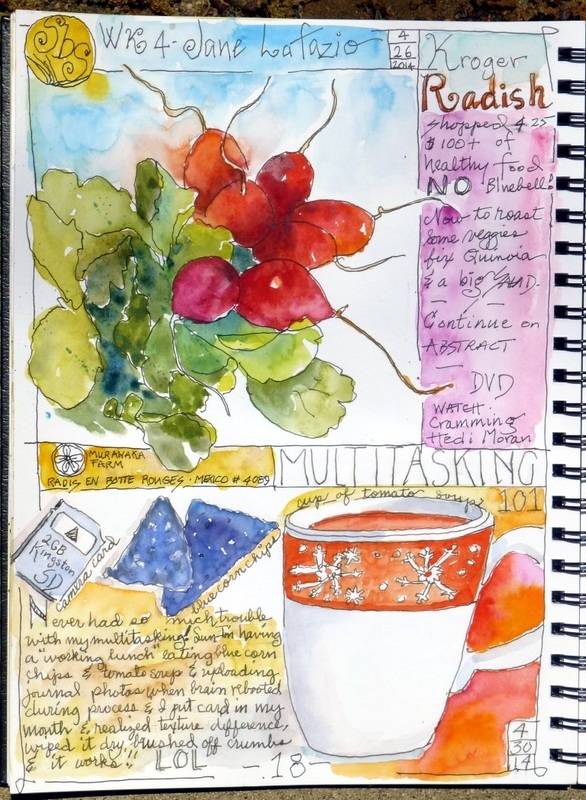 Visual Journal by Strathmore available in Watercolor 140 lb and 90 lb. 6. 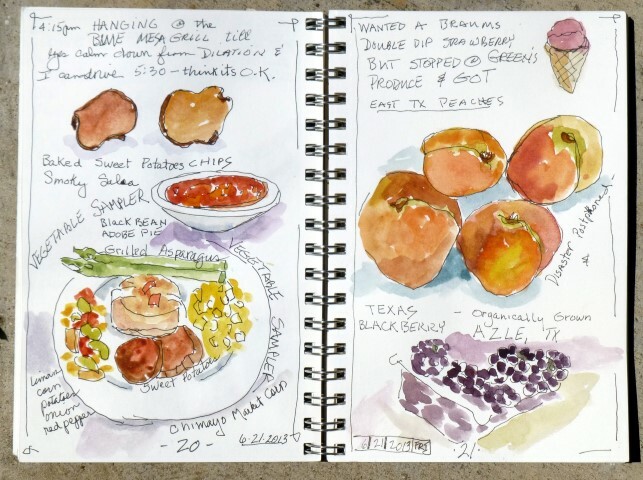 Stillman and Birn has several choices and I've used the Alpha and Beta. Choices are good. There are many choice out there and what you bring will be fine. You can search at the online art stores or look in your local craft stores. Palettes plastic or china and you can use a white china plate if you are using tube colors or a disposable paper plate with a plastic coating. If this is your first workshop and you want to buy one brush, get a round #8 or #10. Brushes (round and flat) You could include among your brushes a 1/4", 1/2", 1" flat, a #6 round, and a #8 or a #10, #12 round. If your brushes are close to these sizes, they’ll be fine for the workshop. Natural hair or synthetic or a blend. Your choice and what you normally use. 2. Pens waterproof (Micron, Sharpie (can bleed through the page but they do have one now they advertise as it won't bleed through the page), Pitt, Uniball Vision Needle Fine, Zig Writer. You will have to read the label to see if the pen you choose is waterproof and make a test. Some sketchbook artists like the way certain pens bleed. Your choice. 3. Glue stick, Double Stick tape for sticking things in your journal and masking tape. I'm looking forward to meeting and painting with you. Some Links you might like to check out and I will add to this list periodically. 1. How to Set up a watercolor palette by Brenda Swenson. Click HERE.